I’m not sure how Goldberg’s Writing Down the Bones has escaped my attention. I was published back in 1986 and chapter 1 is a blueprint for every writing with a stationery affliction to delve deeper into that affliction. For 32 years Goldberg has suggested to readers that they find a pen that lets them write fast on cheap paper that they feel they can write garbage on. Interestingly, without ever reading this book this is advice I’ve given to journalers who have taken my classes- get journals that you will use- that you feel okay slopping paint into, spilling ink onto the pages, a journal where you won’t worry about making mistakes, one where you’ll feel okay simply turning the page. Goldberg adds a snippet at the end of chapter 1 about use of a voice recorder, something even more applicable today when most of us with smart (or even semi smart) phones carry in our pockets. 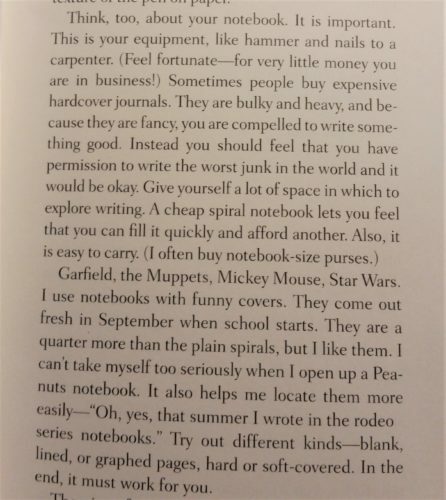 The section about using a computer word processor is pretty cute in that it was written in ’86 when typewriters were the norm. I do wonder what she would say about talk-to-text? It’s interesting to think about the pens and pencils we like and why we like them. 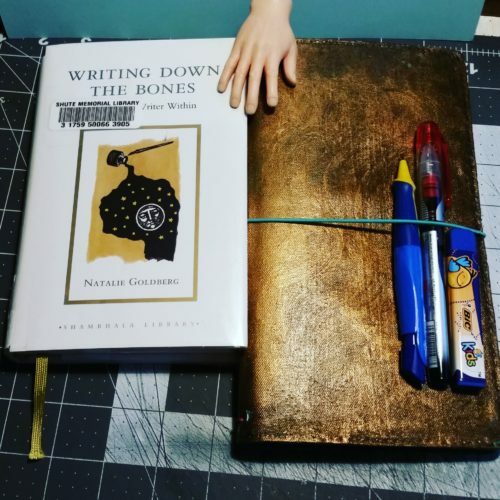 Goldberg mentions a pen being speedy and allowing her to record her thoughts quickly lest her mind out pace her hand. How many times have we had a thought about something we’d like to write or journal about only to forget it once we get pen to paper? Goldberg encourages reader to really deeply think about which pen and paper combination allows them to write freely. I see this as a direct outcropping of her Zen meditation practice. For anyone who has practiced mindfulness writing can be a form, but also focusing on the feeling of pencil or pen on page can really bring about a sense of calm, and that can be channelled into the writing of the novel or into the journaling itself. As a for instance. I’m a fan of rougher paper when writing with pencils. I love the feeling of pencil across the toothy page of a cheap composition notebook. In opposition, my friend Dee of The Weekly Pencil likes smooth paper with her pencils, like Maruman. Alternatively, I like a smooth page for my fountain pens. I like the skating sensation of the nib across the page. Knowing these things about what we like can encourage us to delve deeper into our SABLE stash of materials and actually use them for their intended purpose- writing and arting. This entry was posted in Journaling, Reflection and tagged goldberg, secular, study, sunday, writing on 20170212 by leslie.